This name uses Eastern Slavic naming customs; the patronymic is Ivanov and the family name is Berbatov. Dimitar Berbatov was born on 30 January 1981 in Blagoevgrad to Ivan Berbatov and Margarita Berbatova, both themselves professional athletes: Ivan was a footballer with Pirin and CSKA Sofia, while Margarita was a handball player. His favoured team was the Italian club Milan, and he consequently modelled himself after Marco van Basten, the Dutch forward for that team. However, the 1996 European Championship, held in England, gave Berbatov a new role model; the 15-year-old Berbatov began to look up to the English front man Alan Shearer, who played for Newcastle United. Berbatov's mother later spoke of her son's teenage dream of playing for Newcastle United, and said that his admiration for Shearer was such that, during these years, he slept in a Newcastle shirt. Berbatov began his youth career with his home-town club, Pirin, where his talent was spotted and he scored 77 goals for their reserve team in 92 appearances. Berbatov joined the youth squad of his father's former club, CSKA Sofia, after being spotted by scout and manager Dimitar Penev in 1998. He signed his first professional contract with the club and made his debut during the 1998–99 season, at the age of 18. He won the Bulgarian Cup with CSKA at the end of that season. Berbatov's first game in Europe came in September 1999, in a 2–0 defeat against his childhood team Newcastle United; it was during that season, 1999–2000, that he started to make his name, scoring 14 goals in 27 league matches. Berbatov nearly signed for Italian side Lecce in June 2000, even passing a medical before the move collapsed at the last minute. A run of nine goals in eleven games during the first half of the 2000–01 season was enough to persuade German club Bayer Leverkusen to pay €1.3 million to sign a four-year contract with Berbatov on 1 January 2001. Berbatov played for the club's reserve team in the Oberliga Nordrhein at first, and scored six goals in seven appearances before being promoted to the first team. He made his team debut in a 4–3 pre-season friendly win against D.C. United, scoring a hat-trick. His league debut for the first team came on 10 February 2001, replacing Ulf Kirsten in a 4–1 victory against 1. FC Köln. Berbatov found himself being used as a substitute by manager Berti Vogts, making six appearances and scoring no goals as Leverkusen finished fourth and qualified for the following season's UEFA Champions League. During the next season, Berbatov scored 16 goals and made important contributions to the club's Champions League campaign, scoring in a 4–2 win over English club Liverpool in the quarter-finals as Leverkusen eventually reached the final. In the final itself, against Real Madrid, Berbatov came on as a substitute for Thomas Brdarić after 38 minutes before Leverkusen lost 2–1. Leverkusen also finished as runners-up in the Bundesliga behind Borussia Dortmund, and lost the DFB–Pokal final 4–2 to Schalke 04, thus completing an unusual treble of runners-up finishes. Berbatov established his place as the first-choice forward during the next season, 2002–03, and netted his team's goal against Manchester United on 24 September 2002, during a 2–1 defeat for Leverkusen. He scored 16 goals in 24 league appearances during the 2003–04 season, before the following two seasons saw the Bulgarian raise awareness of his talent by netting 46 goals in the league over the two seasons and five times in the 2004–05 Champions League. During this time, he was linked with numerous foreign clubs, including Celtic, Atlético Madrid and Liverpool. Tottenham Hotspur reached an agreement with Bayer Leverkusen for Berbatov's transfer in May 2006; the fee of €16 million (£10.9 million) made him the most expensive Bulgarian footballer ever. After he was granted a British work permit, the transfer was completed on 1 July 2006. After Tottenham lost 2–0 to Bolton Wanderers in Berbatov's first league match in England on 19 August 2006, he scored his first goal for Spurs three days later in a 2–0 home victory against Sheffield United. Berbatov in 2008, in the colours of Tottenham Hotspur after a match against rivals Arsenal. Berbatov's seven goals in eight European games during his debut season for Tottenham helped the club to secure top spot during the UEFA Cup's group stage, making his second European debut in October 2006, scoring a goal during a 2–0 victory against Beşiktaş. He made a total of eight appearances, scoring seven goals as Tottenham were eliminated 3–4 on aggregate against Sevilla. However, he took a while to adapt to the Premier League, taking a few months to regain the league form he had shown at Leverkusen. He gave a strong performance against Wigan Athletic in November 2006, scoring one and creating the other two in a 3–1 win for Spurs, and began to score regularly. He scored his first FA Cup goals on 18 February 2007 when he came on as a second-half substitute in a 4–0 win over Fulham and netted two of the four goals. Berbatov and Spurs teammate Robbie Keane were named joint winners of the Premier League Player of the Month award for April 2007, and in doing so became the first players to share the award since February 2004. He ended the 2006–07 season with 12 goals in 33 appearances in the Premier League, and won both the Tottenham Hotspur Player of the Season award and a place in the PFA Premier League Team of the Year. Berbatov scored his first Premier League hat-trick on 29 December 2007, scoring four in a 6–4 win over Reading. His first cup final for Tottenham came on 24 February 2008 in the Football League Cup; Spurs faced Chelsea at Wembley Stadium. Berbatov scored an equalising penalty as Tottenham went on to win the game 2–1 after extra time. He ended the season with 15 league goals. Before the next season, 2008–09, Manchester United manager Alex Ferguson was quoted by newspapers as saying he expected to sign Berbatov; Tottenham submitted a complaint to the Premier League alleging that Manchester United had broken league rules. Ongoing rumours of a substantial bid by Ferguson's club unsettled him, and Berbatov was dropped for the games against Sunderland and Chelsea during August, the season's first month. Berbatov moved to Manchester United on 1 September 2008, costing the club £30.75 million and signing a four-year contract. Tottenham had also accepted a bid from Manchester City, but Berbatov claimed after signing for United that he "would not even have thought about Manchester City". Arsenal manager Arsène Wenger, meanwhile, accused Tottenham of having used the complaint to the Premier League to negotiate a higher price for Berbatov from Manchester United. Berbatov marked his Manchester United debut away at Liverpool with an assist for a Carlos Tevez goal, but United lost the game 2–1. His first two goals for the club came in the 3–0 win away to Aalborg BK in the Champions League group stage on 30 September 2008. He netted his first league goals in Manchester United colours during a 4–0 victory over West Bromwich Albion. Alex Ferguson defended Berbatov after he was criticised for missing a penalty during the 2008–09 FA Cup semi-final against Everton, which Manchester United eventually lost by a penalty shoot-out. Soon after, Berbatov scored the fifth of United's goals as they came back from 2–0 down at half-time to win 5–2 against his former team, Tottenham Hotspur. When Manchester United won the Premier League on 16 May 2009, Berbatov became the first Bulgarian to play in an English Premier League title-winning team. After Berbatov struggled to make an impact during the 2009–10 season, there was some media speculation that Berbatov would leave Manchester United, but this was denied by Alex Ferguson. Berbatov scored United's third goal in the 92nd minute of their 3–1 win over Chelsea in the 2010 Community Shield on 8 August. Eight days later, Berbatov scored his and United's first league goal of the season, opening the scoring in their 3–0 home victory over Newcastle United in the club's first match of the campaign. He scored his first hat-trick for United on 19 September, scoring all three of his team's goals in a 3–2 home win over rivals Liverpool; the second goal, an overhead kick, became a contender for the league's Goal of the Season. It was the first treble by a Manchester United player against Liverpool in 64 years. Berbatov made his 100th appearance for United on 10 November in a 0–0 away league draw in the Manchester derby on 11 November 2010. Sixteen days later, he tied a league record by scoring five goals in a game during a 7–1 home victory over Blackburn Rovers; he was the first non-Englishman to net five in a Premier League match, and joined Andrew Cole, Alan Shearer and Jermain Defoe as the only players overall to do so. He was named Bulgarian Footballer of the Year for a record seventh time on 20 December 2010. Berbatov netted his first goals of the 2011 calendar year with his third hat-trick of the season in a 5–0 home win over Birmingham City on 22 January. This made him the first United player since Ruud van Nistelrooy (in 2002–03) to score three hat-tricks in the same season. In January 2011, Berbatov was named by the International Federation of Football History & Statistics as Europe's most popular footballer among active players for 2010. After being dropped to the bench for games against Arsenal and Marseille, Berbatov returned as a second-half substitute for Javier Hernández against Bolton Wanderers on 19 March and scored the winner in the 88th minute (his 20th goal of the season), giving United a 1–0 victory. He scored his 21st in a following Premier League start against Fulham where United won 2–0. As top scorer of Premier League, Berbatov was a member of the PFA Team of the Year for the 2010–11 season alongside Carlos Tevez. Berbatov also shared the Premier League Golden Boot award with his former Manchester United teammate. On 28 May 2011, he was left out of the Manchester United squad for the Champions League Final, in which United lost 3–1 to Barcelona. Berbatov played his first game of the 2011–12 season in an away match against West Bromwich Albion, coming on as a substitute replacing Danny Welbeck, a game which United won 2–1. Berbatov appeared from the substitute's bench against Chelsea, replacing the injured Javier Hernández. United won the game 3–1. Berbatov made his first start of the season in the following game, a League Cup third round clash with rivals Leeds United. He played the full game and was required to play at centre back for the last 10 minutes; youngster Zeki Fryers picked up an injury and United had already used all three permitted substitutes. Berbatov struggled for chances on the night, but United did win the game 3–0. On 25 October 2011, he scored the first goal, after a neat passing build-up and also helped set up a goal for Michael Owen in a 3–0 win against Aldershot Town in the fourth round of the League Cup. On 22 November 2011, Berbatov ended his long run without a goal in the Champions League by scoring the equaliser in a home game against Benfica in a 2–2 draw. On 21 December 2011, he came on as a second-half substitute during a Premier League match against Fulham replacing Danny Welbeck. He scored his 50th goal for Manchester United in all competitions, thus becoming Manchester United's 50th player to score 50 goals for the club. This was also his first goal of the 2011–12 Premier League season. On 26 December 2011, Berbatov scored a hat-trick in a 5–0 win against Wigan Athletic. This was Berbatov's fourth Premier League hat trick for Manchester United and fifth overall in the division. In the next league game against Blackburn Rovers, Berbatov gave away a first half penalty, when he dragged Christopher Samba to the ground. In the second half, after going 2–0 behind, United responded quickly with two goals from Berbatov. The first, he directed his header past the keeper after Rafael da Silva's mishit cross, and then he fired home Antonio Valencia's pullback to level the game. However, United went on to lose the game 3–2. In the 2012 January transfer window, Berbatov was linked with a move to Bayern Munich, but the rumour was quashed when Berbatov's contract was extended for another year. On 31 January, Berbatov scored a goal in a 2–0 league win at Old Trafford against Stoke City, scoring the second of two penalties on the night. On 31 August 2012, it was announced Berbatov had signed a two-year contract with Fulham for an undisclosed fee. He made his league debut the following day, in a 3–0 loss against West Ham United, coming off the bench for Fulham at half-time. On 15 September, he made his home debut and scored twice in a 3–0 win against West Bromwich Albion. On 27 October he scored Fulham's third goal in a 3–3 away draw with Reading. On 10 November Berbatov played 90 minutes against Arsenal, in a game in which he made an assist and scored twice for yet another 3–3 draw. After scoring against Southampton on 26 December 2012, Berbatov took off his shirt to reveal the words "keep calm and pass me the ball" written on his vest, a celebration for which he was yellow-carded and which manager Martin Jol described as "not the brightest thing to do". On 1 January 2013, Berbatov scored the first Premier League goal of the new year when he opened the scoring away at West Bromwich Albion in an important 2–1 away win for Fulham. On 30 January 2013, his 32nd birthday, he scored the first in a 3–1 home win against West Ham, raising his tally in the Premier League to eight since joining the Cottagers. He then scored the only goal in the game against Stoke City on 23 February, followed by another one in the 2–2 draw with Sunderland on 2 March. In Fulham's next Premier League game Berbatov scored the only goal against his old side in a surprise 0–1 away win to Tottenham. On 1 April 2013, Berbatov scored two goals against QPR in a 3–2 win at Craven Cottage, one of them from the penalty spot. This took his season tally in the league to 13 goals, and it also made him the first Fulham player to score in four consecutive league games since Steed Malbranque in 2003. Berbatov's next goal came against Liverpool in the penultimate game of the season. Berbatov rounded off the season with a goal away at Swansea City on the final day in a 3–0 away win. This took his tally to 15 goals in his debut season for Fulham. On the January 2014 deadline, it was reported that AS Monaco had signed Berbatov to replace the injured Radamel Falcao for the remainder of the season. At first, it was believed to be a loan move, although it was later revealed that Fulham had released Berbatov. Berbatov made his Ligue 1 debut in a 1–1 home draw against Paris Saint-Germain on 9 February, coming on as a second-half substitute for Valère Germain. His first goal came three days later, scoring in extra time for a 1–0 win over Nice in the Coupe de France. Berbatov scored his first goal in the league on 8 March in a 2–1 home win against Sochaux. He ended the season with 6 goals from 12 league games and on 16 May, he signed a new one-year contract at the club. In the first leg of the Champions League match against Arsenal, Berbatov scored a second away goal, in a 3–1 victory. He left the club on 1 June 2015, after the club decided against renewing his contract, with Monaco releasing a statement praising the 34-year-old for his "character, his professionalism and his great talent". Monaco president Vadim Vasilyev added: "He is clearly among the greatest strikers who have played for Monaco. We are proud of what he brought to the club and wish him the best in the future." On 2 September 2015, it was announced that Berbatov had signed a one-year contract with Greek club PAOK. The club's owner Ivan Savvidis had been trying to bring Berbatov to the club for three years and he finally convinced him to join. On 10 June 2016, he was released after a single season. After a year without a club, Berbatov signed with Indian Super League club Kerala Blasters on 23 August 2017 on a one-year deal for a salary of ₹7.5 crore (approximately £900,000). Berbatov scored his first goal against ATK on 8 February 2018. He left the club at the end of the regular season in March 2018. Berbatov made his debut for Bulgaria on 17 November 1999, aged 18, when he came on as a substitute for Aleksandar Aleksandrov in a 1–0 friendly loss against Greece. He scored his first goal for his country on 12 February 2000 in another friendly defeat, 3–2 against Chile, and represented Bulgaria at Euro 2004. This was the only major tournament he played at for his country, owing to the team's failure to qualify for other tournaments. He scored a hat-trick in the 6–2 home win in a 2010 World Cup qualification match against Georgia in October 2009, enabling him to bring his goal tally for the national side to 46 goals, just one short of the then all-time top scorer for Bulgaria, Hristo Bonev; after scoring two goals against Malta during a 4–1 friendly away win during the following month, he took the record. Berbatov captained the team from 2006 until May 2010, when he announced his retirement from international football, leaving his tally for Bulgaria standing at 48 goals from 78 matches. In February 2012, newly appointed Bulgaria head coach Luboslav Penev revealed that Berbatov was willing to consider coming out of international retirement and participate in an upcoming friendly against Hungary. Berbatov eventually decided against accepting a call-up for the match, as he didn't feel that he was in top shape, but at the time did not rule out a return to the national side at some point in the future. In September 2012, he reconfirmed his international retirement. In May 2016 it was revealed that Berbatov would return to Old Trafford to play for the Rest of the World in Soccer Aid, a charity football match in aid of the United Nations Children's Emergency Fund (UNICEF), alongside the likes of Jaap Stam, Robbie Fowler and Jamie Carragher. He scored two goals in an eventual 3–2 loss to England. "I am a relaxed guy. I play that way and I can’t change my style. I watch games and see guys who panic on the ball – they look so nervous. I can be calm, because I sometimes know what I want to do before the ball comes to me. The boss [Alex Ferguson] tells me not to change anything – he gives me freedom to express my qualities." Berbatov is known for his footballing intelligence, technical ability and composure; in particular, his unhurried stance in front of goal has been described by The Scotsman's Tom Lappin as "elegant and calm". He also possesses exceptional precision when passing and shooting, and takes his time when on attack in order to ensure the best move possible. As such, he is often used as a deep-lying centre forward, receiving passes from the midfield, holding the ball up and then using his tactical acumen and well-honed skill to bring his teammates into the game. His impressive physical stature combines with these attributes to form a strong all-round attacking player. It is because of these characteristics that he was signed by Manchester United, who intended for Berbatov to complement the combative and busy style of their English striker Wayne Rooney. Whereas Rooney is known for exerting himself vigorously for the entirety of a match, Berbatov employs a more laid-back and composed style, and because of this is sometimes criticised by observers who interpret this as laziness. On signing for Manchester United, Berbatov attracted comparisons with former United forward Eric Cantona, not only because of his languid and impeccable touch, but also because of his bravado and perceived arrogance. Berbatov is, however, capable of adapting his style to play more directly when required; in April 2010, for example, with Rooney absent, Berbatov gave a performance against his former side Tottenham which, in James Ducker's words, was as if he had "decided to take it upon himself to impersonate the England striker". Combining uncharacteristic determination and effort with his regular technical skill, he contributed to the first Manchester United goal and helped United to a 3–1 victory. 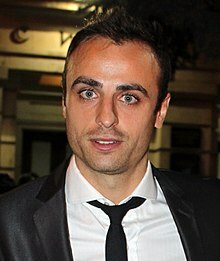 Berbatov learned to speak English by watching the American Godfather series of films; outside of football, he lists his hobbies as drawing and basketball. Berbatov is a sponsor of children's charities in his native Bulgaria, supporting five care homes. He is also the founder of the Dimitar Berbatov Foundation, which helps young people to develop their talents. Berbatov's long-time girlfriend, Elena, gave birth to their first child, a girl named Dea, on 15 October 2009 at a hospital in Sofia. ^ a b c "D. Berbatov". Soccerway. Perform Group. Retrieved 19 November 2017. ^ a b "Dimitar Berbatov: factfile – Manchester United". Manchester Evening News. MEN Media. 2 September 2008. Retrieved 4 September 2008. ^ "Dimitar Berbatov". ManUtd.com. Manchester United. Archived from the original on 3 May 2011. Retrieved 2 April 2011. ^ a b "Dimitar Berbatov". UEFA.com. Union of European Football Associations. Retrieved 24 November 2010. ^ "Berbatov Supports Bulgarian Nurses in Libya". Bulgaria News. Web Media Group. 6 June 2007. Retrieved 4 September 2008. ^ "No dream duel for Berbatov". UEFA. 18 February 2003. Retrieved 10 March 2007. ^ Blackburn, Martin (20 October 2007). "Toon-mad Berbatov slept in Shearer shirt". The Sun. London: News International. Retrieved 23 October 2007. ^ "Toon-mad Berbatov slept in Shearer shirt". South Shields Gazette. Johnston Publishing Ltd. 20 October 2007. Retrieved 23 October 2007. ^ "Bulgaria at Euro 2004: Berbatov". Novinite Ltd. 6 June 2004. Retrieved 23 January 2011. ^ "CSKA Sofia 0–2 Newcastle United". Worldfootball.net. HEIM:SPIEL. Retrieved 13 February 2011. ^ Spellman, Damian (17 September 1998). "Robson's Magpies make it look easy". The Independent. Sofia: Independent News & Media. Retrieved 13 February 2011. ^ "Berbatov flees Bulgaria following kidnap threat". The Independent. London: Independent News & Media. 1 December 2009. Retrieved 27 August 2010. ^ "Lecce scatenato: dalla Bulgaria arriva Berbatov". La Gazzetta dello Sport (in Italian). Rcs Quotidiani Spa. 15 June 2000. Retrieved 2 March 2009. ^ "Berbatov joins Bayer Leverkusen". BBC Sport. 15 July 2000. Retrieved 23 January 2011. ^ a b c "Berbatov, Dimitar". National Football Teams. Benjamin Strack-Zimmerman. Retrieved 23 January 2011. ^ Green, Jeff (25 May 2001). "Welcoming the European champs". Sports Illustrated. Retrieved 17 February 2010. ^ "Bayer zaubert brasilianisch". Der Spiegel (in German). 11 February 2001. Retrieved 23 January 2011. ^ a b "Dimitar Berbatov". ESPNSoccernet. ESPN. Retrieved 23 January 2011. ^ "Lyon win six-goal thriller". UEFA. 31 October 2001. Archived from the original on 8 July 2012. Retrieved 23 January 2011. ^ "Liverpool suffer Euro woe". BBC Sport. 9 April 2002. Retrieved 23 January 2011. ^ "Real crowned champions of Europe". BBC Sport. 15 May 2002. Retrieved 23 January 2011. ^ "Borussia claim Bundesliga title". BBC Sport. 5 May 2002. Retrieved 23 January 2011. ^ "Schalke bash Bayer to retain cup". BBC Sport. 11 May 2002. Retrieved 13 February 2011. ^ "Schalke wins German Cup 4–2". Sports Illustrated. 11 May 2002. Retrieved 23 January 2011. ^ Grkinic, Nada (13 May 2002). "Bayer 'Neverkusen'?". BBC Sport. Retrieved 13 February 2011. ^ "Man Utd hold off Leverkusen". BBC Sport. 24 September 2002. Retrieved 23 January 2011. ^ "Bulgarian Duo in Celtic". Novinite Ltd. 28 July 2004. Retrieved 23 January 2011. ^ "Atletico Confirms Interest in Bulgarian Duo". Novinite Ltd. 18 June 2005. Retrieved 23 January 2011. ^ "The gossip column". BBC Sport. 5 December 2004. Retrieved 23 January 2011. ^ "Tottenham agree fee for Berbatov". BBC Sport. 17 May 2006. Retrieved 23 January 2011. ^ "Dimitar Signs". Tottenham Hotspur FC. 17 May 2006. Retrieved 23 January 2011. ^ "Tottenham signs Berbatov for €16 million". Novinite Ltd. 17 May 2006. Retrieved 23 January 2011. ^ "Spurs new-boy Berbatov 'turned down United offer'". ESPNSoccernet. 18 May 2006. Retrieved 23 January 2011. ^ "Nine for Berbatov". Tottenham Hotspur FC. 17 May 2006. Retrieved 18 May 2006. ^ McKenzie, Andrew (19 August 2006). "Bolton 2–0 Tottenham". BBC Sport. Retrieved 23 January 2011. ^ McNulty, Phil (22 August 2006). "Tottenham 2–0 Sheff Utd". BBC Sport. Retrieved 23 January 2011. ^ Sinnott, John (19 October 2006). "Besiktas 0–2 Tottenham". BBC Sport. Retrieved 20 October 2010. ^ Brown, Sophie (2 November 2006). "Tottenham 3–1 Club Bruges". BBC Sport. Retrieved 20 October 2010. ^ Warren, Dan (14 December 2006). "Tottenham 3–1 Dinamo Bucharest". BBC Sport. Retrieved 20 October 2010. ^ Sinnott, John (19 October 2006). "Besiktas 0–2 Tottenham". BBC News. Retrieved 13 February 2011. ^ Hookham, Richard (5 April 2007). "Sevilla 2–1 Tottenham". BBC Sport. Retrieved 13 February 2011. ^ May, John (12 April 2007). "Sevilla 2–2 Tottenham (agg 3–4)". BBC Sport. Retrieved 13 February 2011. ^ Sanghera, Mandeep (26 November 2006). "Tottenham 3–1 Wigan". BBC Sport. Retrieved 20 October 2010. ^ Lyon, Sam (9 December 2006). "Tottenham 5–1 Charlton". BBC Sport. Retrieved 20 October 2010. ^ Sinnott, John (18 February 2007). "Fulham 0–4 Tottenham". BBC Sport. Retrieved 20 October 2010. ^ "Keane & Berbatov win April award". BBC Sport. 7 May 2007. Retrieved 20 October 2010. ^ a b "Dimitar Berbatov". Premier League. Archived from the original on 19 August 2010. Retrieved 20 October 2010. ^ "Dimitar Berbatov". Tottenham Hotspur FC. Retrieved 20 October 2010. ^ McIntyre, David (29 December 2007). "Tottenham 6–4 Reading". BBC Sport. Retrieved 20 October 2010. ^ Stevenson, Jonathan (24 February 2008). "Tottenham 2–1 Chelsea". BBC Sport. Retrieved 24 February 2008. ^ "Ferguson 'embarrassed' for Spurs". BBC Sport. 19 July 2008. Retrieved 13 February 2011. ^ "Tottenham submit Berbatov dossier". BBC Sport. 21 July 2008. Retrieved 13 February 2011. ^ "Match Squad Update". Tottenham Hotspur FC. 23 August 2008. Retrieved 23 August 2008. ^ "Man Utd complete Berbatov switch". BBC Sport. 1 September 2008. Retrieved 13 February 2011. ^ "Tottenham Financial Records" (PDF). Tottenham Hotspur FC. 10 November 2009. Archived from the original (PDF) on 22 November 2009. Retrieved 10 November 2009. ^ "Manchester United deal". Tottenham Hotspur FC. 1 September 2008. Retrieved 2 September 2008. ^ "Berbatov not tempted by Man City". BBC Sport. 12 September 2008. Retrieved 12 September 2008. ^ Carrick, Charles (12 September 2008). "Arsene Wenger accuses Tottenham of Dimitar Berbatov 'trick'". The Daily Telegraph. London: Telegraph Media Group. ^ Sanghera, Mandeep (13 September 2008). "Liverpool 2–1 Man Utd". BBC Sport. Retrieved 13 September 2008. ^ Hibbs, Ben (30 September 2008). "Berbatov Plays It Cool". Manchester United F.C. Retrieved 1 October 2008. ^ "Sir Alex leaps to defence of Berbatov". ESPN Soccernet. 20 April 2009. Retrieved 2 July 2009. ^ Ashenden, Mark (25 April 2009). "Man Utd 5–2 Tottenham". BBC Sport. Retrieved 26 April 2009. ^ "United's Berbatov First Bulgarian to Win England Premier League Title". Novinite Ltd. 16 May 2009. Retrieved 20 October 2010. ^ "Dimitar Berbatov not leaving Manchester United, says Sir Alex Ferguson". The Daily Telegraph. London: Telegraph Media Group. 21 May 2010. Retrieved 21 May 2010. ^ Fletcher, Paul (8 August 2010). "Chelsea 1–3 Man Utd". BBC Sport. Retrieved 8 August 2010. ^ Chowdhury, Saj (16 August 2010). "Man Utd 3–0 Newcastle". BBC Sport. Retrieved 16 August 2010. ^ McNulty, Phil (19 September 2010). "Man Utd 3–2 Liverpool". BBC Sport. Retrieved 19 September 2010. ^ "Liverpool sunk by Berbatov hat-trick". CNN. 19 September 2010. Retrieved 19 September 2010. ^ Coppack, Nick (11 November 2010). "Berba's century". Manchester United F.C. Retrieved 11 November 2010. ^ Chowdury, Saj (27 November 2010). "Man Utd 7–1 Blackburn". BBC Sport. Retrieved 27 November 2010. ^ "Berbatov tells journalists to stop voting him top player". The Irish Times. Dublin: Irish Times Trust. 21 December 2010. Retrieved 21 December 2010. ^ Whyatt, Chris (22 January 2011). "Man Utd 5–0 Birmingham". BBC Sport. Retrieved 22 January 2011. ^ Hibbs, Ben (22 January 2011). "Man Utd 5 Birmingham 0". Manchester United F.C. Retrieved 22 January 2011. ^ "The World's Most Popular Footballer Amongst Currently Active Players in 2010". International Federation of Football History & Statistics. 21 January 2011. Retrieved 21 January 2011. ^ Shemilt, Stephan (19 March 2011). "Man Utd 1 – 0 Bolton". BBC Sport. Retrieved 23 March 2011. ^ "Berbatov and Tevez share Golden Boot". Premier League. 26 May 2011. Archived from the original on 28 May 2011. Retrieved 26 May 2011. ^ McNulty, Phil (28 May 2011). "Barcelona 3–1 Man Utd". BBC Sport. Retrieved 28 May 2011. ^ Magowan, Alastair (25 October 2011). "Aldershot 0–3 Man Utd". BBC Sport. Retrieved 26 October 2011. ^ Allsop, Derick (21 January 2012). "Ferguson insists Berbatov is staying at United". Mirror Football. Trinity Mirror. Retrieved 25 January 2012. ^ "Berbatov Signs For Fulham". Fulham FC. Retrieved 31 August 2012. ^ "Fulham 3–0 West Brom". BBC Sport. British Broadcasting Corporation (BBC). 15 September 2012. Retrieved 15 September 2012. ^ "Arsenal 3–3 Fulham". BBC Sport. British Broadcasting Corporation (BBC). 10 November 2012. Retrieved 10 November 2012. ^ Cox, Gerry (26 December 2012). "Fulham 1 Southampton 1: match report". The Daily Telegraph. Retrieved 18 May 2014. ^ Rumsby, Ben (30 January 2013). "Fulham 3 West Ham United 1: match report". The Telegraph. Retrieved 15 September 2013. ^ "BBC Sport - Transfer Deadline Day: Dimitar Berbatov joins Monaco on loan". BBC Sport. ^ "World Match Centre - FIFA.com". FIFA.com. Archived from the original on 31 January 2014. ^ "Dimitar Berbatov was released by Fulham - ESPN FC". ESPNFC.com. ^ "Contract extension for Dimitar Berbatov". AS Monaco FC. Archived from the original on 17 May 2014. Retrieved 16 May 2014. ^ "Arsenal 1–3 Monaco". BBC Sport. ^ "Monaco confirm Berbatov departure". Goal.com. ^ "Παίκτης του ΠΑΟΚ ο Ντίμιταρ Μπερμπάτοφ". 2 September 2015. ^ "Dimitar Berbatov joins Kerala Blasters on a one-year deal". Goal.com. 23 August 2017. Retrieved 23 August 2017. ^ Bharali, Abhijit (23 August 2017). "ISL 2017: Dimitar Berbatov set to become 3rd highest paid player in Indian football". Sportskeeda. Retrieved 23 August 2017. ^ "ATK finally manage a draw". The Telegraph. 9 February 2018. Retrieved 12 July 2018. ^ a b c d "Dimitar Berbatov – Goals in International Matches". Rec.Sport.Soccer Statistics Foundation. Retrieved 23 January 2011. ^ "1999 Matches – Europe (October – December)". Rec.Sport.Soccer Statistics Foundation. Retrieved 23 January 2011. ^ "2000 Matches – Intercontinental (January – March)". Rec.Sport.Soccer Statistics Foundation. Retrieved 23 January 2011. ^ "Dimitar Berbatov happy with Bulgaria retirement decision". The Guardian. London: Guardian Media Group. 24 September 2010. Retrieved 23 January 2011. ^ Kostadinov, Petar (13 May 2010). "Dimitar Berbatov's record with Bulgaria's national football team". The Sofia Echo. Sofia Echo Media Ltd. Retrieved 23 January 2011. ^ Iliev, Nick (19 November 2009). "Berbatov becomes Bulgaria's all-time goalscorer in 4–1 win over Malta". The Sofia Echo. Sofia Echo Media Ltd. Retrieved 23 January 2011. ^ a b "Berbatov to Wear Captain's Armband of Bulgarian Football Team". Novinite Ltd. 22 March 2007. Retrieved 23 January 2011. ^ "Berbatov not for sale, says Man Utd boss Ferguson". BBC Sport. 21 May 2010. Retrieved 18 July 2010. ^ Генова, Марина (4 September 2012). "Бербатов отказа на националния". topsport.bg. Topsport.ibox.bg. Retrieved 17 November 2012. ^ "Valencia community vs. Bulgaria". footballdatabase.eu. 28 December 2004. Retrieved 7 June 2012. ^ "Liverpool and Manchester United legends are first football players for Soccer Aid line-up". Unicef. 3 May 2016. Archived from the original on 5 June 2016. Retrieved 3 May 2016. ^ a b c "Dimitar Berbatov: Fergie Says My Relaxed Style is Just Fine!". Bleacher Report. 2 February 2009. Archived from the original on 8 July 2011. Retrieved 13 February 2011. ^ a b "Tom Lappin: United can soften Rooney blow by getting in tune with Berbatov". The Scotsman. Edinburgh: Johnston Press Digital Publishing. 3 April 2010. Retrieved 13 February 2011. ^ a b Ducker, James (13 September 2008). "Berbatov style all his own". Irish Independent. Dublin: Independent Newspapers. Retrieved 13 February 2011. ^ Ducker, James (26 April 2010). "Dimitar Berbatov: Fergie Says My Relaxed Style is Just Fine!". The Times. London: Times Newspapers Ltd. Retrieved 13 February 2011. ^ "Dimitar Berbatov Soccerbase". Soccerbase. Centurycomm. Archived from the original on 21 April 2009. Retrieved 30 November 2010. ^ Endlar, Andrew. "Dimitar Berbatov". StretfordEnd.co.uk. The Website of Dreams. Retrieved 24 October 2010. ^ a b c "Dimitar Berbatov: Overview". Premier League. Retrieved 28 September 2018. ^ "Dimitar Berbatov Wins Bulgaria Man of the Year Award". Novinite. 4 December 2009. Retrieved 4 December 2009. ^ "Berbatov Wins 7th 'Bulgarian Football Player of the Year' Prize". Novinite Ltd. 20 December 2010. Retrieved 23 January 2011. ^ "Quel est votre Top Player 2014". AS Monaco FC. Archived from the original on 7 October 2014. Retrieved 12 September 2016. ^ "Berba Named Player Of The Season". fulhamfc.com. 12 May 2013. Retrieved 12 May 2013. ^ "DIMITAR IN THE SWING". Tottenham Hotspur FC. Archived from the original on 21 July 2006. Retrieved 12 September 2016. ^ "Bulgaria's Berbatov signs one-year deal at Monaco". The Sofia Globe. ^ "Ronaldo secures PFA awards double". BBC Sport. 22 April 2007. Retrieved 24 May 2018. ^ "Spurs' Gareth Bale wins PFA player of the year award". BBC Sport. 17 April 2011. Retrieved 24 May 2018. ^ "Berbatov scoops Barclays award". Barclays Premier League. Archived from the original on 20 December 2010. Retrieved 12 September 2016. ^ "Berbatov claims second Barclays award". Barclays Premier League. Archived from the original on 30 August 2011. Retrieved 12 September 2016. ^ Webmaster. "The Players". FIFPro World Players' Union. ^ Burt, Jason (24 November 2006). "Bayer Leverkusen 0 Tottenham Hotspur 1: Berbatov excels in the spotlight to put Tottenham through". The Independent. London: Independent News & Media. Archived from the original on 19 October 2007. Retrieved 22 January 2011. ^ "Dimitar Berbatov". BBC Sport. 23 June 2004. Retrieved 20 May 2006. ^ "How Manchester United star Dimitar Berbatov played his way out of poverty". Daily Mirror. Trinity Mirror. 13 September 2006. Retrieved 13 September 2007. ^ "Dimitar Berbatov becomes father of baby girl". USA Today. 15 October 2009. Retrieved 17 October 2009. Wikimedia Commons has media related to Dimitar Berbatov.